Making Cushions - Sew What Sew Anything - Sew What? Sew Anything! In a four month period Sew What Sew Anything was busy making cushions. we re-covered, or made brand new, 33 cushions for clients. 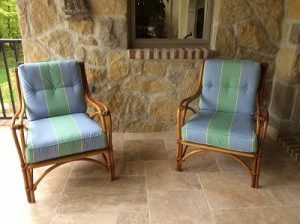 It all started with the re-making of six cushions for a Pottery Barn wicker sectional. The client loved the sectional but it had become very uncomfortable to sit on. The problem was the cushion foam which had broken down. This breakdown was caused by the construction of the wicker base which had an indentation causing the cushions to drop about an inch into the base. To help solve the problem with the cushions falling into the wicker base we added a 1″ super firm foam to the wicker base to prevent the cushions from slipping into the base. To make the cushions beautiful (and weather resistant) we covered the cushions with Sailrite – Sunbrella fabric. Sailrite, a distributor for Sunbrella fabric, has the best prices on the Sunbrella fabric. Sunbrella fabric is specially treated for water resistance, abrasion, UV resistance, and colorfastness. It is the only fabric that we will use for outdoor furnishings and sun porch furniture. It worked, and wow, the client was so happy with the results! She really didn’t want to let the beautiful wicker sectional go, our problem-solving and craftsmanship should help her reclaim and enjoy her favorite furniture from Pottery Barn for many years to come. What other projects did we do to reach the 33 cushion total? – Three season room makeover collaboration with local interior designer included cushions for a sectional, matching chair and footstool all crafted with Sailrite fabric, and coordinating buttons. – A new mattress, with a unique shape, for a Recreational Vehicle. Crafted for a repair shop based on their measurements and diagrams. It was a perfect fit. So, whether it is updating older furniture, or a new remodel, an RV or outdoor furniture, at Sew What Sew Anything we make cushions. Beautiful cushions.